Stud for playfield plastic posts- #6-32: #6 machine thread on top and bottom, 32-threads-per-inch pitch. 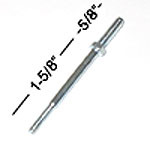 5/8-inch height on top thread for mounting extension posts on top, or securing wireform ramps, etc. For use on most games using #6-32 screws and accompanying plastic posts. Often stripped or broken, and as a unique pinball only hardware piece, can be hard to find. Grab a few for valuable spares! #6-32 is the smaller size (smaller diameter) of the two sizes of this part used on games over the years. Some later-model Bally/Williams games (late 1980s and up) may use the larger #8-32 size part. Use with #6-32 nylock nuts or nylon or rubber cap nuts, to hold down plastics and other mounting parts. Use with #6-32 t-nuts for securing under playfield.